Ah, fall, that enchanting time of year when green leaves transform to brilliant shades of red, orange, and gold, and bright orange pumpkins dot all of the doorsteps in the neighborhood. I can’t resist buying big bunches of green, red, and yellow apples every September. What’s even more fun is taking the kids to the apple orchard and having them pick some. 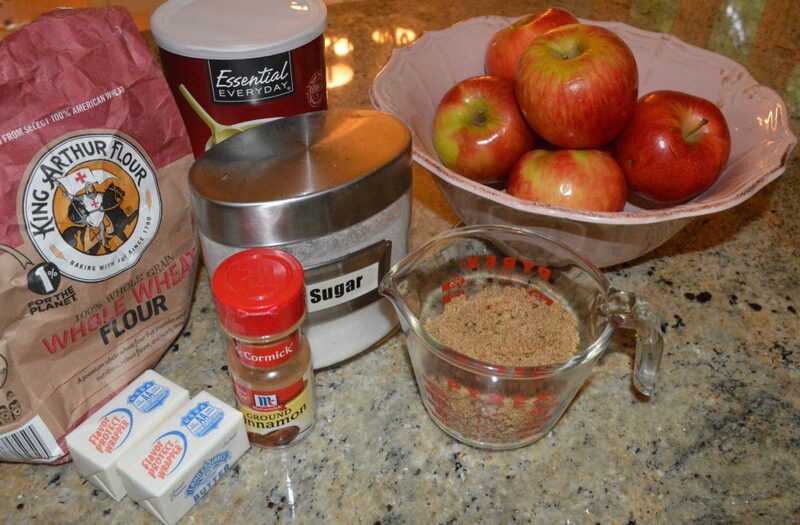 One of my favorite desserts to make in the fall is a simple apple crisp. 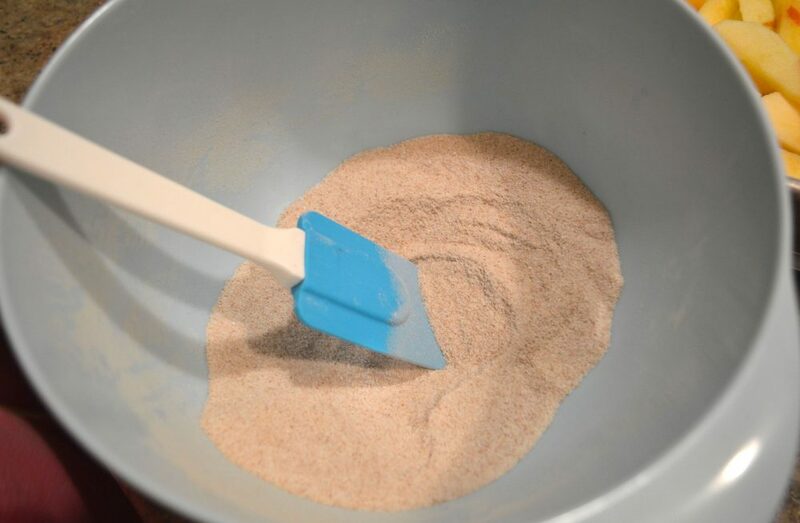 This recipe– one that my husband’s grandmother used when he was little– is fantastic. It contains the perfect amount of apple-to-crisp topping ratio (meaning, heavy on the crisp!). Plus, you can use whatever types of apples you have on hand. I used the crisp, slightly sweet Honeycrisp variety for the recipe in these photos, but Granny Smith apples have been a hit in my house too. Be sure to peel the apples, and try mixing apple varieties if you want to get crazy. 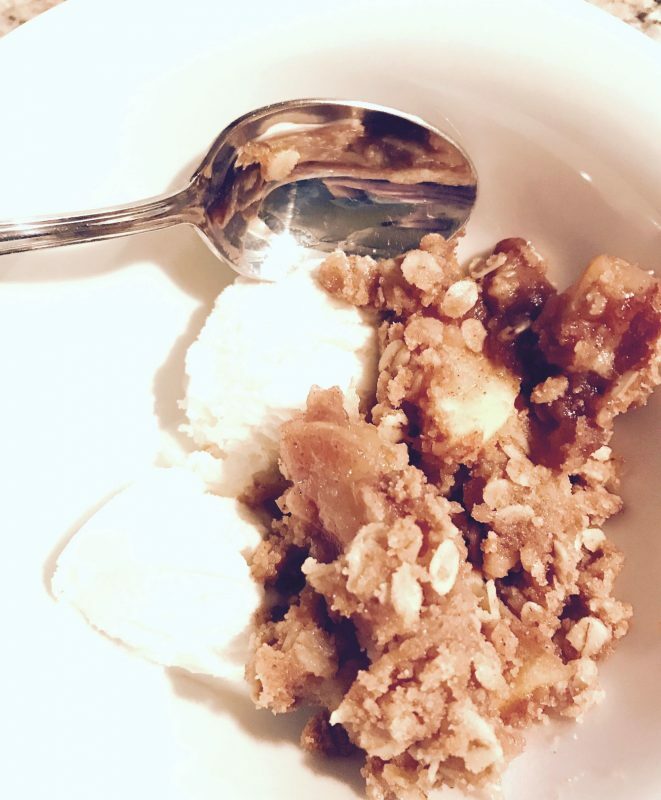 A side note: If you’re scratching your head pondering the differences among apple crisp, apple crumble, and apple cobbler, you may be interested in my research on the subject. Cobblers have a biscuit layer on top of the baked fruit; crisps and crumbles have a streusel-like topping made of oats or cereal. With even more digging, I discovered the distinction between crisps and crumbles on kitchn.com: “The original difference between the two lay in the streusel topping: crisps would contain oats and crumbles would not. 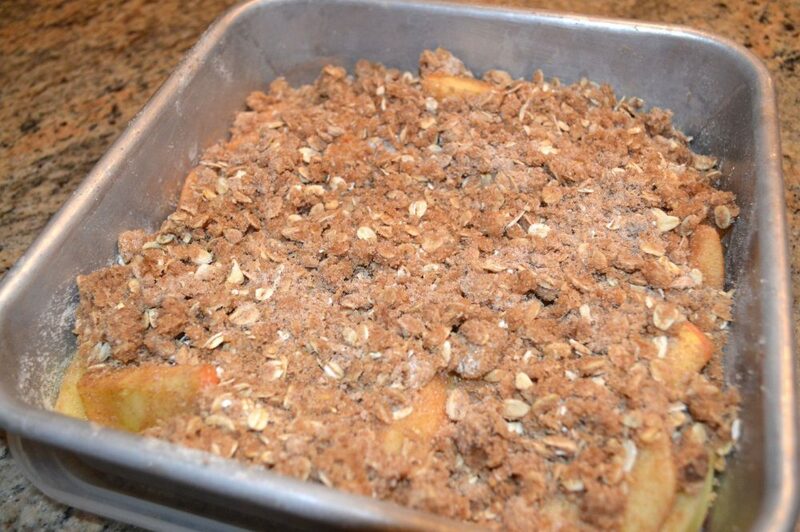 In an actual crisp, as in apple crisp…the oats in the topping crisp up as it bakes, hence the name.” There you have it. 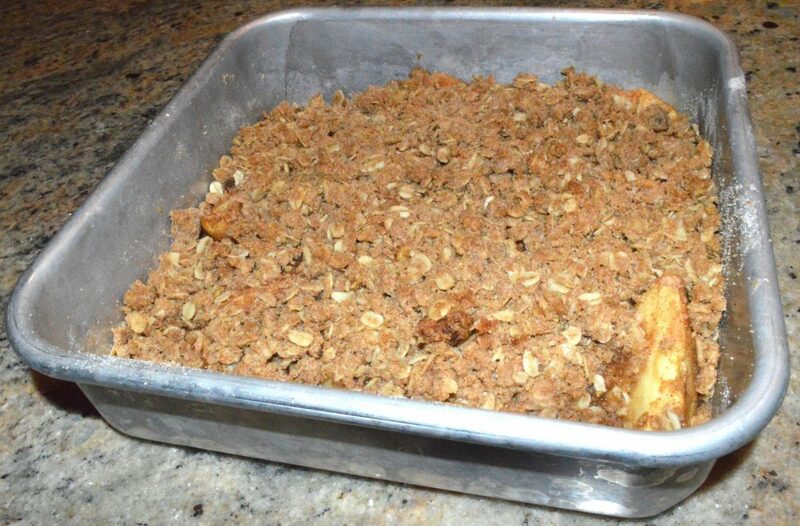 This recipe, folks, is indeed an apple CRISP. 1. Peel and slice the apples. Place in a 9×13 inch pan. Or, like me, place in a 9×9 pan for a thicker dessert. I like to spray Pam on the pan to make clean-up easier. 2. 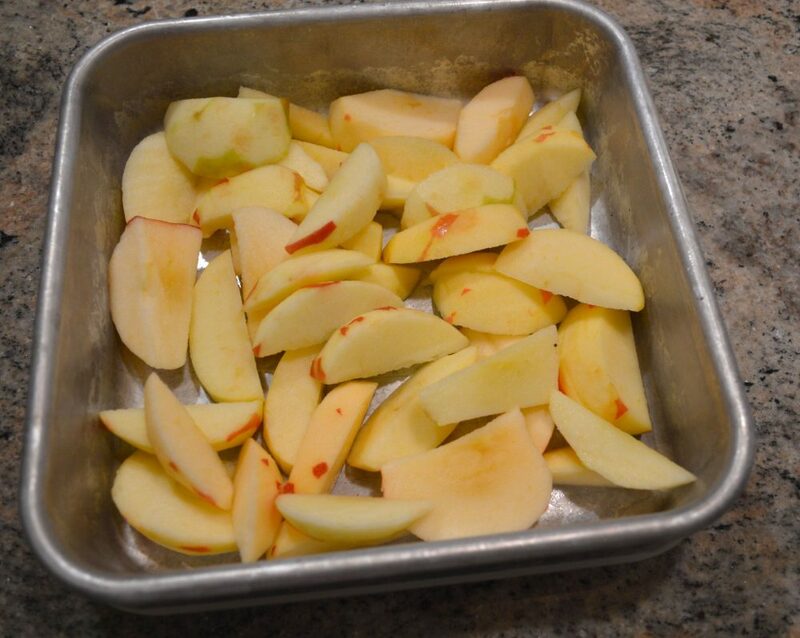 Mix 3 tablespoons flour, white sugar, and cinnamon together and pour over the sliced apples. Give it a stir to mix it into the apples. I can’t help singing “stirring and stirring and stirring my brew!” whenever I stir…anything. 3. 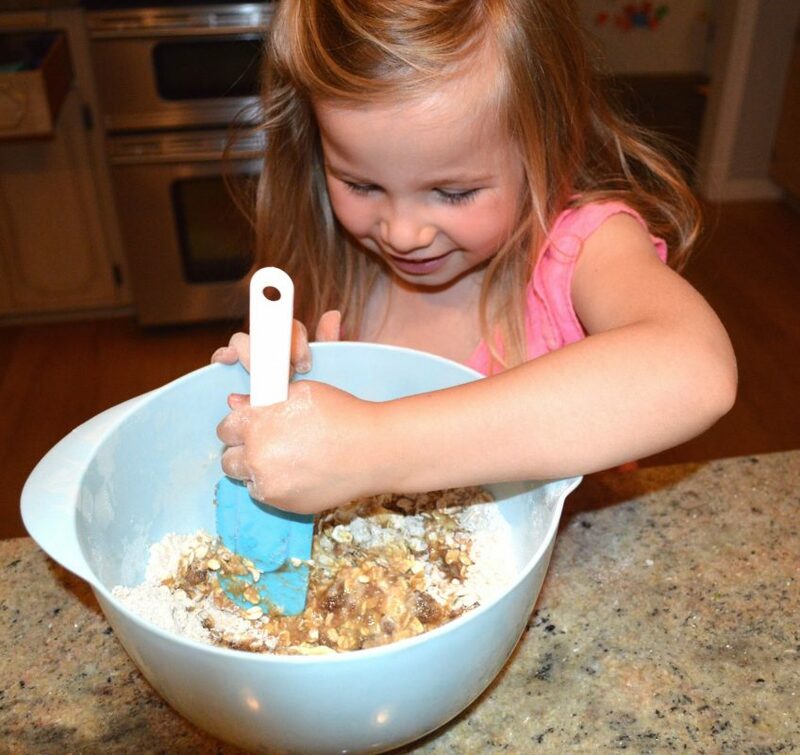 In another bowl, mix the topping ingredients (brown sugar, flour, oats, and melted butter). My little helper loves to stir it up. 4. Place the topping evenly on top of the apple mixture. It takes all of my resolve not to eat this before it goes in the oven. 5. Bake at 350 for 45-50 minutes. Serve warm with vanilla ice cream for extra deliciousness. Looking for more delicious and easy recipes? We have them here! 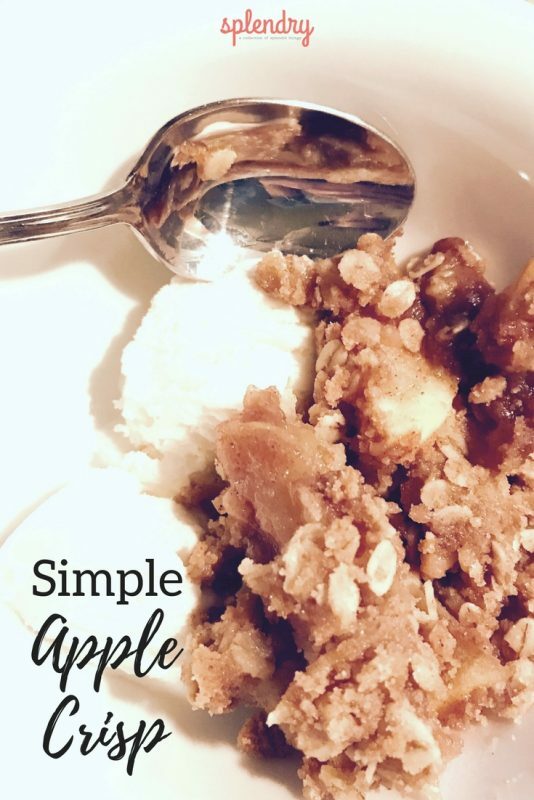 Apple crisp is one of my favorite simple desserts! <3 This looks awesome! It’s one of the best desserts, I agree! I hope you try this recipe. It’s SO good! Happy Fall :).